Wells Fargo recently presented Peoples’ Self-Help Housing with a $25,000 donation. From left are Wells Fargo Assistant Vice President Raul Lorca, Regional President Joe Mathai, PSHH’s Monica Scholl and Wells Fargo Vice President and District Manager Kathleen Voss. 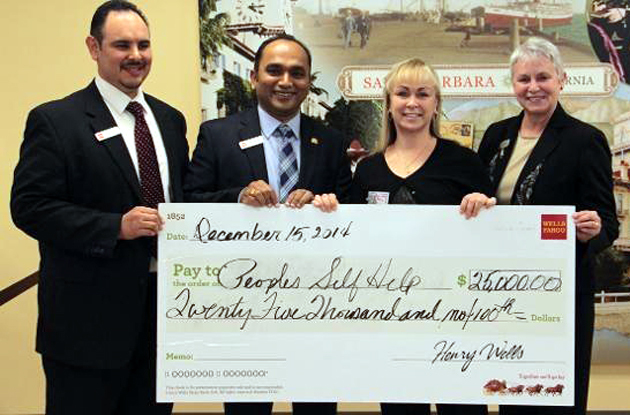 Wells Fargo recently presented a $25,000 donation to the nonprofit Peoples’ Self-Help Housing designated for affordable housing for low-income households in Santa Barbara and San Luis Obispo counties. The check was presented to PSHH’s Monica Scholl by Wells Fargo Assistant Vice President Raul Lorca along with Wells Fargo Regional President Joe Mathai and District Manager Kathleen Voss. “We are proud to partner with Peoples’ Self-Help Housing as you work toward achieving our shared goals in the community,” said Sandy Cha, Wells Fargo Vice President and Community Affairs Officer. Founded in 1970, PSHH is an award winning nonprofit organization that develops affordable housing and community facilities for low-income households and homeownership opportunities for working families and special needs populations, such as seniors, the disabled, veterans, and the formerly homeless. With over 1,200 self-help homes completed and 1,620 rental units developed and now managed by PSHH, it is the largest affordable housing developer on the Central Coast with offices in Santa Barbara and San Luis Obispo. For more information, visit www.pshhc.org or call 781-3088 or 699-7227.